Lots of people struggle with losing weight, and it seems to be getting worse and worse as our obesity levels go up. 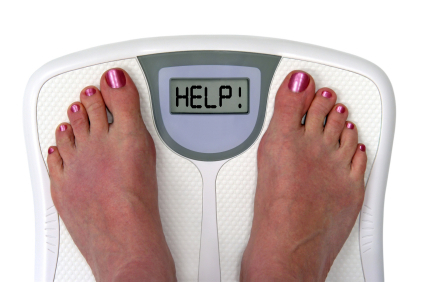 In this day and age where there is a pill or alternative therapy for everything, it can seem terribly disturbing to people to not be able to get their weight sorted. Philosophically, I think that half the problem is the back lash against thin models, which is creating an opposite of more over-weight people. Hopefully the media will at some point get some sense and start to focus on the middle road; hmmm that might be a bit optimistic, it doesn’t sound like a media sort of thing does it? Maybe the media will just get bored of it one day? So why does it APPEAR to be so hard? (You need to be careful that you aren’t walking around saying ‘weight loss is so hard’ all the time, because it can become a self-fulfilling prophecy. We get told all sorts of conflicting messages like ‘it’s about eating less’, ‘it’s about combining different foods’, ‘lose 10stone in 2 weeks’ (OK so that’s an exaggeration, but you know what I mean), or ‘this is the ONLY way to lose weight’. Everyone seems to know why, but no one seems to have a fool proof method that works for everyone. Why? Because you need a combination of things in order to succeed in a healthy long term manner. Thats the tough and important thing to understand. However, if I can do it, then you can totally do it! I had fertility problems and gave up smoking, and that is what I used to complain about when I was trying to lose weight. It’s true that sometimes there can also be physical barriers, but the first step is to stop complaining. Yes it might be more difficult if we are tired or have physical issues that make it more difficult, but those barriers can be overcome. So just decide that the fact that you have a few more barriers is great, because it means that you will gain way more satisfaction than other people at losing weight. It’s all about how you look at the situation, not what the situation is. However, you don’t HAVE to lose weight. If you are going to do it, then keep coming back for my tips and I’ll help out, but you will have to stop complaining about how hard it is. If you feel like you should do it, because you are overweight or not at a weight you enjoy then you have a choice. Decide whether you want to sort it out now, or be realistic and decide to do it later if you know that you don’t really want to. Instead learn to appreciate what you’ve got and come back here another time, or continue complaining for a few months and come back here! So what are the four areas again? So you are going to need to make sure that you are mentally up for it, and feel enthusiastic about it, otherwise you’ll only last a couple of weeks. The more heartfelt your motivation, the easier it will be for you. Then you need to make sure that you are drinking enough water, because otherwise your body thinks that you are in a desert and can’t function fully. (Tea, coffee, fizzy drinks and diet drinks don’t count!). Think about a car without oil; that is your body without water, basically wrecked inside! Update: Check out my post about hydration for more info. I’ll give some tips on eating, but you need to find the right balance between just enough to make sure that your body doesn’t think you are in the sahara and dieing, but little enough to allow you to lose weight. Plus, there is no doubt that eating in a healthy way will help. (This time it is a car without petrol!). Update: I’ve started a whole blog series on ‘Healthy Eating For Rubbish Cooks‘. When it comes to exercise, you might need some good professional advice, but I will get you started in the tips. The wrong exercise can actually make you heavier or get in the way of achieving your goals, so it’s really important. Plus, there is no point in hurting yourself and ending up lieing in bed for a few weeks getting even lardier! Update: I’ve started a whole blog series on ‘Exercise Tips‘ too. There can be emotional reasons that we don’t want to lose the weight (subconsciously), although it only hits a few of us, and isn’t always the reason. Normally by working on the mindset aspect you can overcome this. If you find that tips only get you so far, and you really did the exercise in my mindset video, then this could be the final problem. If there is enough interest, then I can do a few more posts on why we might have emotional blocks and how to tackle them. Just let me know. Plus remember my ‘Problem Corner‘ which you can ask me something anonymously; I’m more than happy to help out. There can also be physical problems, but these tips will still help you. I’ve managed to lose weight despite Polycystic Ovarian syndrome, giving up smoking and now Fibromyalgia and meds that have put weight back on me. So it is possible, maybe a little tougher, but definitely possible. Plus sign up for the RSS feed for my blog, or subscribe by email or join my facebook page so that you keep getting my posts. I’ve got soooo much to tell you! Video Wed: What are you going to fight for? I think there’s quite a big difference between people *needing* to lose weight because it’s a health risk (e.g. risk of diabetes because of obesity) and people that *should* or *would like* to lose weight. For the former group, your post is spot on – it’s a mindset thing and the first thing to overcome is the psychological side. For the second group, which I sometimes put myself into, it’s a bit more straightforward and just take a bit of willpower, encouragement and commitment. An interesting thing here, a company I’ve done some work for called AudioFuel, which makes running music, has observed this trend and has slashed the price of its starter range of music, to encourage people to take their first steps. …and it’s the first steps that are always the hardest. Interested in your views on AudioFuel and doing exercise to music too..? Thanks Phil – yep the problem is that the people who ‘need’ to lose weight, will often spend ages faffing around because of the pressure and never get their head in the game. Check out my video on my facebook page (it describes here how to do it https://mummywhispererblog.com/2011/05/weight-loss-are-you-really-up-for-it/) it might give you the willpower you need. That Audiofuel idea sounds fabulous! I’m a HUGE fan of music to get us to do anything. For running I was a big Linkin Park fan. I hate aerobics, but love any kind of dance class like Body Jam, Zumba, Belly Dancing etc. One of the problems with some of the dance games is rubbish music; they just buy the cheap trash. I’m a weight class athlete, and I spend a lot of time managing my weight the healthy way. I’m technically under-weight by BMI standards (but BMI doesn’t work for the extremely athletic, ranking them too fat/thin when they clearly aren’t). In the course of managing my weight I encounter a lot of people who are either very overweight, or just a little fluffy, and doing extremely unhealthy things to try to lose weight – yet those people lecture me on my choice to have only a small ice-cream cone at the beach instead of a huge sundae. Your post is a refreshing take on weight loss. Drink lots of water, eat the right amount of calories (too few is as bad as too many! ), ideally made up of fresh, healthy food, and do a sensible amount of exercise. There’s no need to kill yourself in the gym two hours a day, every day, or to starve yourself and cut out ALL treats. Weight loss is a lifestyle change – not something you do for a few weeks then forget about. Sorry for such a long comment – it’s something I’m passionate about! Thank you so much Etali – and don’t worry about the length of comment, I really appreciate hearing from people like yourself. Yep, I’m not a big fan of the BMI either – I did a post about measuring yourself properly and listed a pile of others as alternatives. That is the sound of the penny dropping. I had always thought that my fluid intake is fine – after all I drink up to ten cups of tea a day. Admittedly all with two sugars in, but that’s a whole nother problem to ask you about! To read, in black and white, that tea doesn’t count, is actually quite disturbing. The other thing is whether it is possible to be addicted to sugar. I can’t seem to cut it out. When I do, I am headachy, shivery, and looking at the syrup tin with lustful eyes! Am I just being pathetic? Could there be a problem? Great blog post by the way. I got here via that blogcarnival! LoL Sarah, it seems so obvious when we know, but we just aren’t taught useful stuff like water vs tea at school! Wow, those four points are so obvious but not until you’ve made them for us! Of course! Or, ‘doh’ as Sarah said! Hydration: I do already drink a lot of water and very little of any other drink except green tea and sometimes a coffee. Mindset: I come up with plenty of ‘justifcations’. Healthy Eating: I get into habits of too many ‘treats’ rather than keeping them for every now and then–real treats. But over all, Im a pretty healthy eater. So, I need to focus on exercise, mindset and cutting back on treats–thats a pretty straight forward equation! thanks! Lol I only realised how obvious they were after years of struggling myself! Let me know if it makes a difference, if not, we’ll come up with some more ideas for you. This site is so cool and I will visit again in the future for ..
Nigeria women who are desperate in getting a guy that we satisfy them.